If you walk around West Seattle along California Avenue, you may notice a series of colorful murals painted on the sides of some of the neighborhood buildings. Beginning in the south at Fauntleroy, and heading north to the Alaska Junction, scenes from West Seattle’s history are depicted by talented local muralists, as well as artists from as far away as Louisiana and Newfoundland. 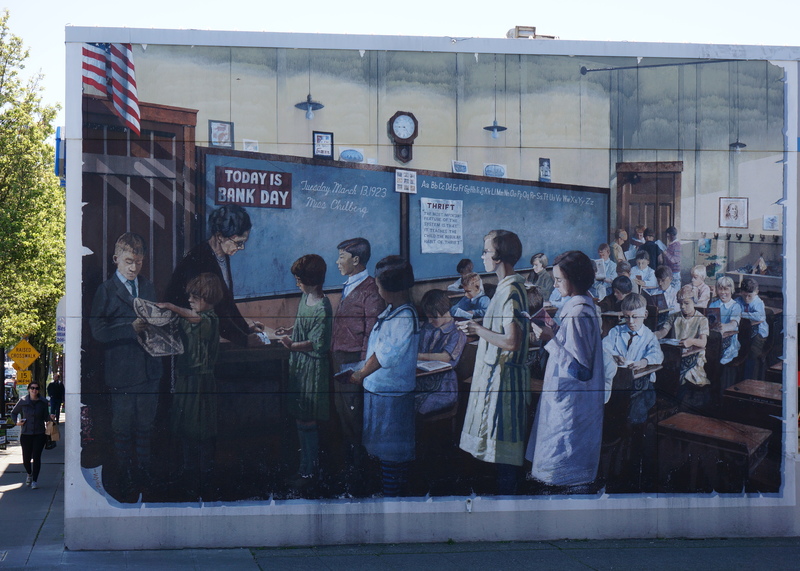 The murals were completed in 1990 to celebrate and document events in the history of West Seattle, where the settlement that became the city of Seattle began. local writer and West Seattle resident Lori Hinton goes into more detail about the murals and shares other tips for fun things to see and do in West Seattle in her book, “West Seattle 101“. We even have our own Log House Museum, down by the beach in Alki, where you can learn about the beginnings of Seattle, and the Duwamish and Salish tribes who inhabited the region for centuries before the arrival of the Denny party.